We are down to the last days countdown for the wedding! JW, my brother, has been here since Monday helping us get ready. Things are really busy here trying to prepare everything-doing a wedding in another country is much different that doing one in the states. No wedding supply stores, no Factory Card Outlet, none of your friends here to help! Despite all that, I have to say this is going to be a pretty fantastic wedding that we are super excited about! 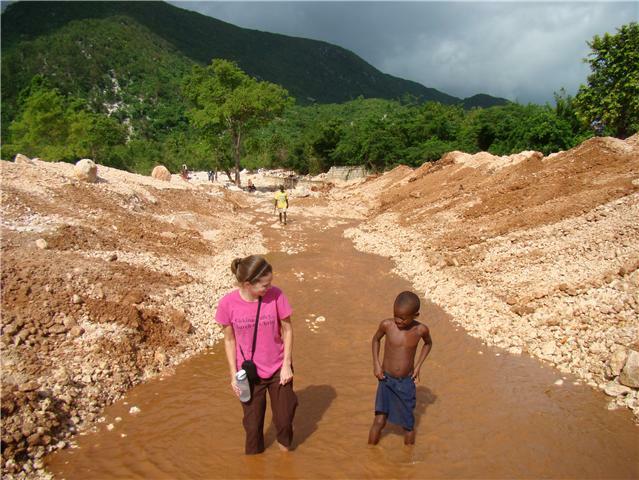 I remember in Feb of 2008 my dad drug me to Haiti on a mission trip. There was a guy named David who was the driver who took us from the airport to the guesthouse. I saw him again the last day of the week long trip and had my dad take our picture together in front of the truck. We just said "Hi" b/c I didn't speak Creole. I came home and said I was never going to back to Haiti. Here I am in 2012, living in Haiti and marrying the FIRST Haitian guy I met the FIRST time I stepped foot in Haiti. God has a plan and a sense of humor. I am laughing b/c I never imagined I would learn another language to the extent of living on my own in another country with a child. I remember crying in language school here in 2009 wondering if I would EVER "get it". Now I am having my wedding ceremony in that language! I am laughing b/c when my dad and I first got home from our first trip an were looking at pictures and we came across the one of David and I, my dad said, "Looks like he needs to eat a hamburger...or two." That skinny guy will now be his son-in-law...God has a sense of humor. I am laughing b/c one of the groups that are singing in the wedding asked if they could sing Whitney Houston's "I Will Always Love You" b/c it is a beautiful song and because they wanted me to have a song in English. Good thing I checked on WHAT songs they were singing or I would have had one of the greatest break up songs EVER sung at my wedding! I am laughing b/c although I am really bummed that none of the friends from the states could make it, I have crazy friends here on the mission field who are going OUT OF THEIR WAY to help us make this day special. I am laughing b/c we have been given a goat and 2 turkeys already as wedding gifts. Seriously. The turkeys are still alive...I think they may become pets. I am laughing b/c I am happy. Though this life is crazy and I imagine will continue to be...God has a plan.